Nissan takes the bling down a notch on the 2014 370Z NISMO hoping its look will match the tastes of those in the tax bracket required to own one. The 370Z NISMO is the Z that walks the walk. Cars like this Z and the Subaru WRX are throwbacks to a recent era when young men tuned their imports and took the streets late-night for illegal races through the city. Now they more often drive cartoon versions of those cars in mom’s basement using a video game controller. With wild wings and front spoilers that would be torn off in any normal parking situation, the cars are road going, but impractical. However, they fly - sometimes literally. The wings on the WRX and the Z don’t do much until the cars start to experience lift at around 100 miles per hour. The truth is the sport has matured and the cars are now going to as well. The biggest change to the 2014 NISMO Z is the body side cladding, lower valances, front air dam and the big honking wing on the trunk. Nissan realizes these are necessary to be included in the factory tuner club, but needed to de-emphasize them. It chose to turn as much of these parts as practical a dull gray color to minimize the visual effect. In order to try and add a bit of refinement to the look Nissan added a red pin-stripe on most of these parts. Overall the effect is good. Inside the 2014 NISMO Z gets an Alcantara (faux suede) steering wheel which is still round. Most competitors now make the bottom flat for practicality and to channel the spirit of F1 racing. A new NISMO tachometer is also included. Carrying on is the larger displacement V6 from Nissan, the 3.7 liter still with 350 HP. This is good news because the revamped 3.5 liter V6 engine Nissan is now using on most its cars (often coupled to a CVT) is not as powerful. 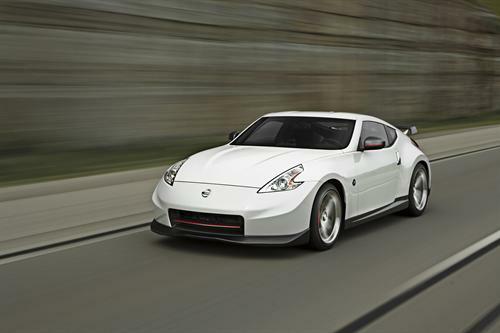 For 2014 the only transmission in NISMO Z is the close-ration 6 speed manual. This comes with the original SynchroRev Match system that matches revs on downshifts for the driver. This takes the place of the heel-toe driving slowly going extinct as MGB drivers with string-back leather gloves begin to (sadly) become less common. We have driven the 370Z hard on the track with this system engaged and loved it. If you are a person who takes pride in his ability to manage three pedals with two feet, good news, the system can be shut off. Nissan must be doing something right because the new 2014 Chevrolet Corvette, and the new 2014 Porsche 911 have copied Nissan’s system. Some Z’s have been accused of being all show and no go (notably here by a Torque News writer!) However, the NISMO Z is the real deal and its look now matches its book. The NISMO Z’s $45K price is not a fee that many boy-racers can pay, but for those with NISMO aspirations and a barista’s budget Nissan is now applying the NISMO treatment to the Juke.